If you are an avid phone user and can't live without your phone even for a second, the worst thing that can happen to you is you ending up with a frozen phone. Phones get frozen for several reasons and if your phone has been frozen because of a user-side issue, you can get it rectified by following a few simple methods. In today's world, it is common to see phone freezing issues and it happens to everyone at least once with their phone. If your phone has frozen and you are unable to perform anything with it, the following guide will offer you some methods to unfreeze your phone and get it working again. These are some basic methods, but they work like a charm and so go ahead, follow them, and get your phone fixed. Part 1. How to Fix a Frozen iPhone? The two most common phones are iPhone and Android phones. If yours is an iPhone that has frozen, this section will help you unfreeze it using some easy to follow methods. If you use an Android phone, please skip to the second section of this guide. When your iPhone gets frozen, the first thing you will want to do is restart your phone. However, since it is frozen, you cannot use the standard method of rebooting an iPhone to reboot your device as that requires interacting with the device and your phone has hanged so it won't respond to your interactions. For iPhone XS, XS Max, XR or iPhone X, 8, 8 Plus, then press the volume up and down button. Then, long press the side button till the Apple logo appears and the device restarts. For iPhone 7/7 Plus, then long press the volume down and side button till the Apple logo appears and the device restarts. Your iPhone will reboot, and it should be unfrozen now. Even if you have been successful in unfreezing your iPhone using the above method, there is no guarantee that your iPhone will never get frozen again. There are a few precautions that you can take to ensure your iPhone never gets frozen and freeing-up the memory space on your device is one of those precautions. When you find that your iPhone gets frozen too often, you may want to look at the amount of free memory available on your device. iPhones usually get frozen when they run out of memory space and so you should keep some amount of memory always available on the device. Launch the Settings app on your iPhone and head to General followed by Storage & iCloud Usage. Tap on Manage Storage on the following screen and get rid of the items that you don't use but occupy a large portion of your memory. If the methods shown above didn't work for you, you may want to take help of a third-party software to help you fix the iPhone frozen issue. Fortunately, there is a software called ReiBoot that allows iPhone users to get rid of several issues on their devices. 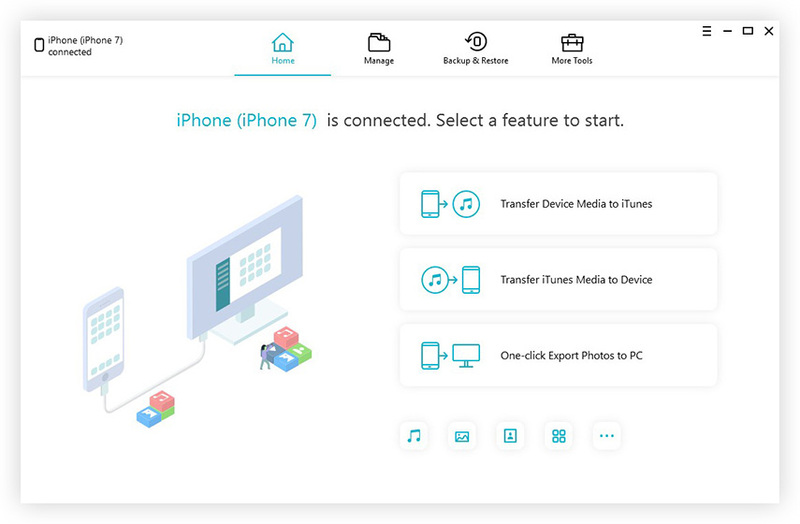 Tenorshare ReiBoot has been built specifically to deal with iPhone errors and it can help you fix several issues that you face on your device in no time. The following is how you can use it to unfreeze your frozen iPhone. Step 1: Download and launch the software on your computer. Connect your frozen iPhone to your computer and click on Repair Operating System in the software. Step 2: Click on Start Repair on the following screen to to begin repairing your device. You will be asked to download a firmware for your iPhone. Click on Download to begin downloading the required firmware. Step 3: The software will begin repairing your iPhone and you will see the following on your screen. Once the repairing is done, you have successfully unfrozen your iPhone. If your Android phone gets frozen too frequently, this section will offer you some guidance as to how you can avoid getting your phone frozen and how you can unfreeze a frozen Android phone. This should also help you with the Samsung phone frozen issue.. It could be that an app has made your phone unstable and if that is the case with you, the first thing you need to do is close the unresponsive app on your device. You can force-close an app on your Android device by launching the recent apps menu and swiping away the unresponsive app. If your Android phone is still frozen and is not responding to your interactions, you can force reboot it and that should resolve the issue for you. You can do it by pressing and holding down the Power button on your device until your device reboots. If the force restart method fails for you, your last option is to remove the battery out of your device and that will shut it down completely no matter what. Remove the back cover of your device, locate the battery, remove the battery, and you are done. If you don't already know, there's a recovery mode on your Android phone that helps flash files as well as factory reset your device. You can use the wipe data/factory reset option to fix your issue. To reboot your Android phone into the recovery mode, press and hold down Volume Up and Power buttons on most phones. Once inside recovery, tap on wipe data/factory reset and factory reset your phone. You may first try choosing the reboot system now option to see if that helps resolve the issue. If anybody ever tells you "my phone is frozen", refer them to the above guide as it offers some of the practical and working methods to fix the phone freeze issue for most devices. We hope it helps you out with your issue. How to Fix iPhone 8/8 Pus Frozen on Apple logo?